For the second week of Make it or buy it, I've found another expensive children's boutique item. I'm starting to see a trend here. I have no idea how I ended up with such expensive tastes, especially since I've never actually purchased any expensive children's clothing. 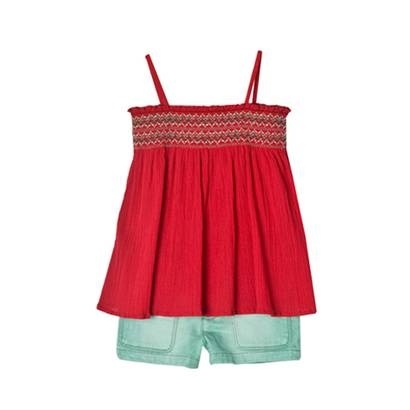 I couldn't help but fall in love with this adorable little summer outfit from Bonpoint. Sadly, the price is likely to bring tears to your eyes, and for play clothes! $165 for the shirt alone. No way. So I studied the images on the stores site for a little while and I think I have come up with the simplest way to recreate the look. I haven't actually sewn it yet, because I can barely keep up with my current to do list, but when I do I will post a full tutorial. In the meantime if you would like to do it yourself here is what I recommend. The top is made of two rectangles, each twice the width of a good fitting non stretch shirt and an inch or two longer for hemming. The top area is shirred with elastic thread and then embroidered in a simple zig zag pattern using three different shades of green. It can be done by machine or by hand. Once that is done sew up the side seams and make two tubes of fabric for the the spaghetti straps. After the shiring is secured by the embroidery or top stitching sew two straight lines down the shirred portion of the back for additional securing then cut right between them. Hem the edges and attach buttons to onside and make button holes on the other. Another option is hook and eyes. I plan to make the shorts out of cutoff jeans, and use the the left over denim to make the flaps for faux welt pockets. Most of this is incredibly easy but working with elastic thread may seem a bit scary to a beginner until they try it. If the embroidery makes you nervous just top stitch in a zig zag pattern with a thick thread. Or use regular thread and go over it a few times. Let me think about this. Pay over $165 + international shipping or pay $10 and spend a few hours on my favorite hobby, sewing. It's a tough call but I think I'll go with Make It. Please let me know if you make this look so that I can link to it, and I promise to post a full tutorial once I catch up on my other sewing projects.